The following is an update regarding the progress of the Clinton Street bridge project, downtown Defiance. 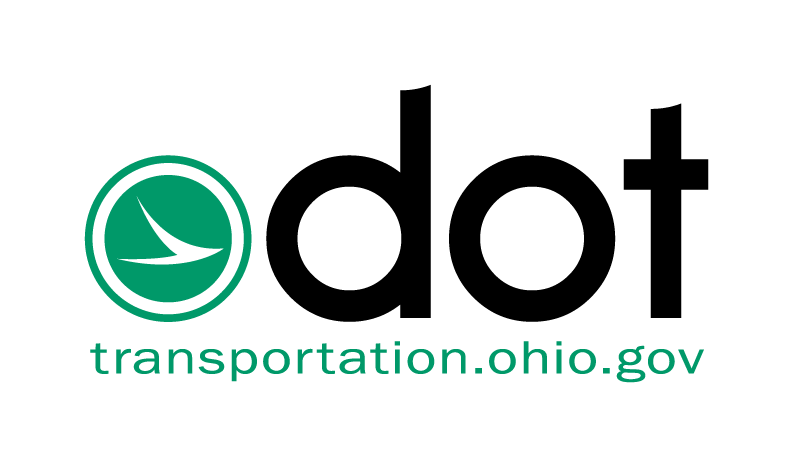 The $8.3 million project will completely replace the bridge which carries state Routes 15, 18 and 66 over the Maumee River. The bridge closed Feb. 25, 2019 for approximately nine months. The project is scheduled for completion July 2020. What's happening now and in coming days . . .
You likely know this, but the river rules when it comes to working in and around it. The Maumee River level was up by about seven feet from the weekend's rains which temporarily halted construction of the causeway. The causeway extending into the river from the north side is complete. The south side is still under construction. The causeway creates an access point from the river for crews and their equipment. Crews have removed all but two spans of the bridge, but because of the river level, demolition work has stopped until the water recedes. What lies beneath? You never know, and we didn't. An original sandstone footer from an even earlier version of the Clinton Street bridge, estimated to have been constructed in the 1880s, was discovered beneath the north side of the bridge and has created the need to redesign the new bridge’s footer. Much of the sandstone footer has been removed but the redesign of the new one will work around that which remains. The run-in with history is not expected to result in a delay in the project. The reinforcing steel cages for the concrete drilled shafts are being constructed. Work on drilling the shafts began today on the north side. The shafts will become the foundation for the new bridge abutments. Next week, the plan is to remove the foundations of the former piers beneath the water line and to begin drilling the shafts for the new piers. Demolition of the remaining section of the bridge is expected to resume next week. On Deck . . .
Q. Wouldn't the causeway that's being constructed function as a dam? A. The causeway is being built to create an access point within the river for crews and their equipment. 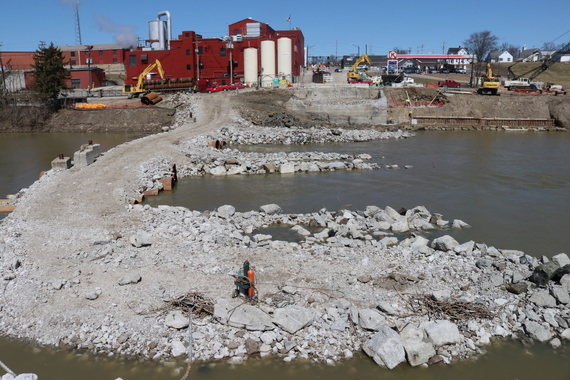 It is being built in a manner that allows the Maumee River to continue flowing throughout construction. Large metal pipes were placed below the rocks on the causeway to keep the river flowing beneath it. The difference in the river level from one side of the causeway to the other is very minimal. In the photo below of the causeway, you can see the metal pipe extending beneath the stone over top. Follow the project . . .